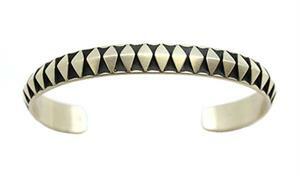 This sterling silver, satin finish men's bracelet is made with cut wire to form diamond shapes in a row. It measures approximately 3/8" wide. It is Navajo hand made by Leander Tahe. Wrist size measures just under 6" with a 1 1/4" opening. It is slightly adjustable.